HM The Queen has recognised people on the Isle of Wight for their hard work and dedication to a range of charities and organisations. Mr John Bernard Roger MATTHEWS receives an MBE for services to Dentistry. Angela TATE receives an MBE for Probationers and voluntary work to the community in the Isle of Wight. Ms Elizabeth TAPPENDEN receives an MBE for services to Small Business Start-ups and Women in Business on the Isle of Wight. Mr Reginald Robert BARRY – receives a BEM for services to the Community. 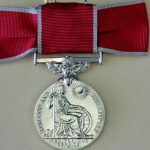 Mrs Ann Marjorie Francescia PEMBROKE – receives a BEM For services to the Cultural History of the City of London. Mr Scott John WATKIN – receives a BEM for services to people with Learning Disabilities.